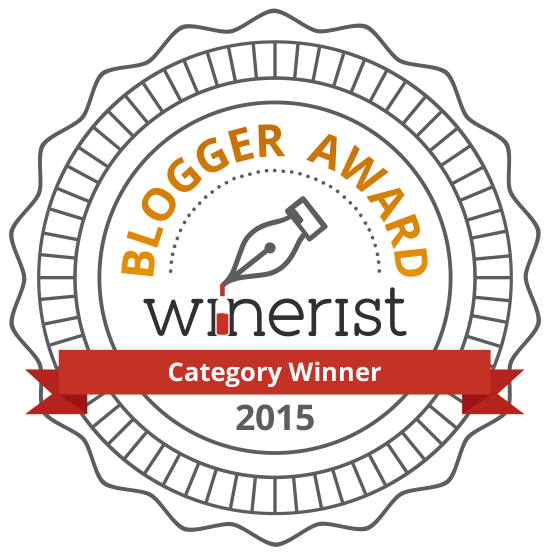 Ready to talk Barbaresco and Barolo wine tour planning? 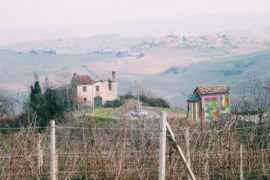 In my Piedmont Travel Planning series, we’ve talked about how to get to Alba, when to visit Piedmont, and how to get around the Langhe. 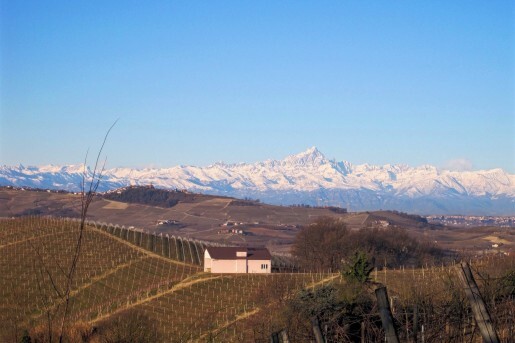 Now, for the fun part – tips and tricks for planning your Piedmont wine tour. 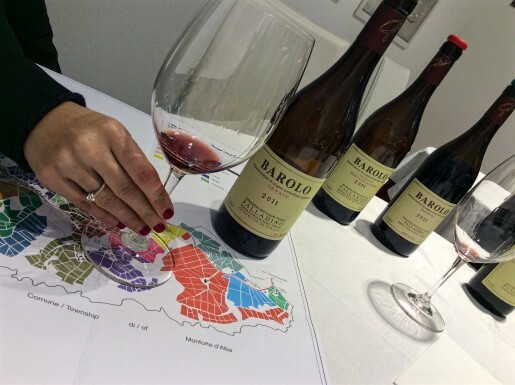 A visit to Barolo and Barbaresco wineries is not your typical tasting experience. Often you are welcomed into family homes that also serve as the winery (or cantina as we call them here). I tell clients that it’s a relaxed day and we take it as it comes. But, I insist we start on time because the producer stops almost always run long. Trust me, you don’t want to be rushed when a producer insists on opening just one more bottle. Barolo wine tasting with the lovely folks at Palladino in Serralunga d’Alba. Maps are essential to understanding the vineyard location and the taste profile of the wines. 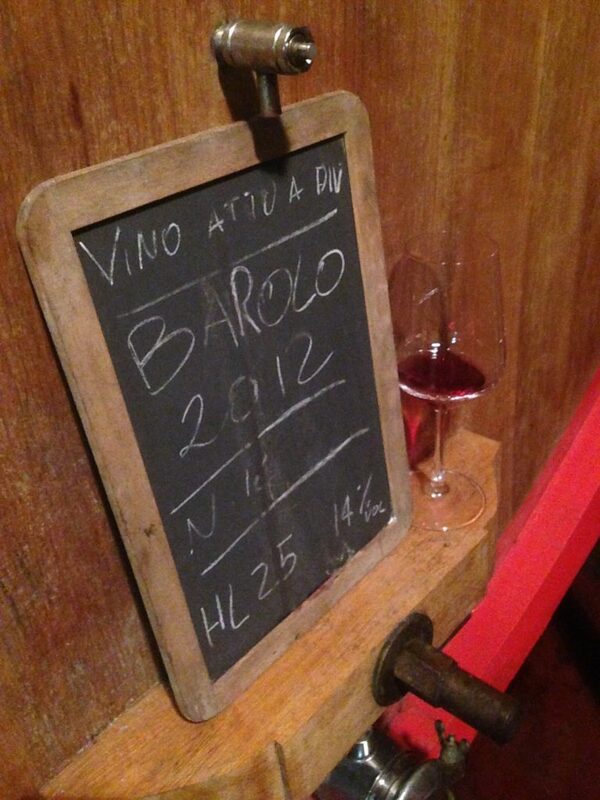 There are not a lot of drop-in tasting rooms in Barolo and Barbaresco. Some producers have them in a few villages, but the real authentic experience happens at the winery. Here, you get to see how the proprietor and their family has made wine for generations. Each stop is a little different with insight into the region’s tradition and culture. And usually, the staff is the family. Do I need to schedule tasting appointments? Always. For us westerners, we are used to places like Napa and Sonoma where the winery has staff dedicated to an on-site tasting room. That is not how it works with a Barolo wine tour. Always schedule an appointment. Please resist the urge to just stop in for a tour. The majority of the producers here have a limited number of staff members, so a last minute two-hour plus tour and tasting affects them. 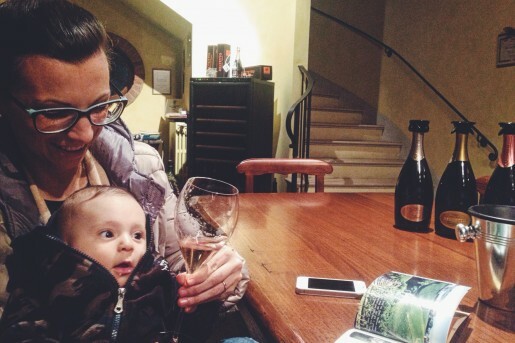 How do I find wineries to visit for my Barolo wine tour? You can start by researching sites like TripAdvisor to identify producers who take visitors. Also, do some Google searches to find articles on the region with recommendations on producers to visit. Expat and tourism sites are other good places to learn about the local producers that would appeal to you. When I used to travel to Italy for holiday I would ask my neighborhood wine shops, wine bars, and Italian restaurants. 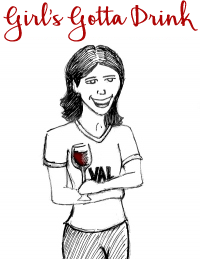 I always enlisted staff help in selecting my wine so it made sense to get tips on producers to visit. Wine tasting at Deltetto in the Roero. How many appointments should I book in a day on my Barolo wine tour? For our Piedmont wine tours we recommend two – and, no more than three winery visits – in a day. We say this because the visits generally go long. We like guests to truly experience everything the producer offers. That can include vineyard walks or barrel tastings, tasting indigenous varieties or different Barolo or Barbaresco vintages. Another reason is that the region is so spread out. Even if you are in the same area you can expect at least 15 minutes of drive time between producers or villages. How to organize your time. If you can, focus on a certain area each day. When we get more than one day with clients we start with a day in Barbaresco. These wines tend to be softer, more approachable due to a more maritime climate. It’s a good way to kick off your Barbaresco and Barolo wine tour. 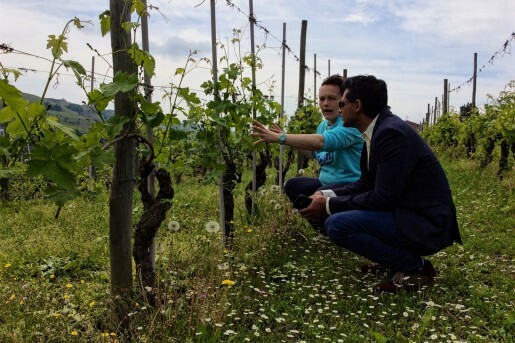 If you spend one day in the Barbaresco zone, then another day in the Barolo zone you can get in more village stops and have more time with producers. It also makes it easier to fit in three visits if you want to try to do more. And, don’t miss out on the lesser known Roero region. There are plenty of great producers there including Demarie, Deltetto, Matteo Correggia, and more. The soils are sandier so the aged Nebbiolo (Roero Riserva) tends to be more approachable early and less expensive. Make sure to try the Roero Arneis, one of the area’s most popular whites. When should I start booking appointments? Once you’ve identified a list of producers you want to visit contact them early to schedule your appointments. It might take time for them to respond as the locals are not as tied to technology. Some only check email a few times a day. Be patient and book early. Always confirm the appointment a day or two before the visit. Producers who book an English-speaking tour will have someone to lead it in English, but just know that if you call to confirm (which is the best approach), you may get someone who only speaks Italian. Just be patient and try to communicate the reason for your call as best you can. Google Translate will get you by. How to schedule your appointment times. If you are driving yourself make sure to get a sense of the travel times between stops. Since the region is so spread out it can take anywhere from 10 minutes to an hour to get from one location to another. Make sure you have an idea of your drive time before booking appointments close together. I map tour days out in advance with Google Maps. I recommend trying to work in at least a 30-minute cushion to account for appointments running long or driving direction mishaps – GPS isn’t always accurate in our rural ‘hood. A Barbaresco vineyard walk with Claudia Cigliuti of Azienda Agricola Cigliuti. What if I’m running late to my tasting appointment or lunch reservation? As I mentioned, appointments often run long and getting around the area takes time. So, it’s not uncommon to fall behind after the first stop. Just make sure to contact the producer or the eatery where you have a lunch or dinner table booked. They will generally be understanding and do their best to accommodate. Just know that many eateries close the kitchen around 14:30 (2:30 pm), so if you want to eat, you need to communicate your delay. And, be prepared if they say they cannot wait that long. What is Piedmont tasting room etiquette? Lunch Hour: Be respectful of the lunch hour. Some parts of Italy have stopped practicing the two-hour lunch hour, but not Piedmont. Here, most places shut down for two hours between 12:30 and 15:00 (3:00 pm). A Second Taste: Revisiting a wine is fine, just make sure to ask the host to pour it for you instead of taking the bottle to do it yourself. Tasting Fees: The practice of charging tasting fees varies in Piedmont. More and more producers are starting to do it to cover inventory costs since tourism has increased in recent years. Ask about tasting fees when booking your appointment. You can also ask if the fee is waived with a minimum purchase. I’ve always found that to be a good incentive to take a few bottles with me. If the producer does not charge a tasting fee and opens numerous bottles (five or more), it is a nice gesture to buy a bottle or two. It’s not necessary or required and they will not be offended if you do not. But, remember that your host has likely been away from other business activities to welcome you. Even one bottle shows appreciation for their time and passion. Barrel tasting Barolo at Cascina Fontana. 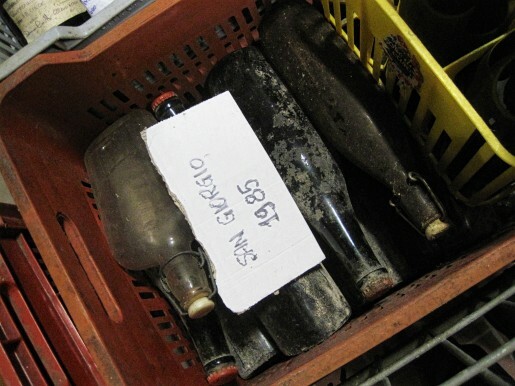 Old vintages at Azienda Agricola Cieck in San Giorgio (outside of Turin). Hiring a Langhe tour guide service is a great way to explore the region. Your tour provider will handle the heavy lifting of organizing appointments, lunch stops, and cultural visits. They can even arrange to ship for you if you are bringing wine home from Italy. Most tour guides around here work on a private tour basis, so that means your Barolo wine tour will be customized to your interests. They will pick you up at your location, handle all the driving, and drop you off at the end of the day. Contact us for more Piedmont wine tour information. We offer a custom travel and tour service and if we are booked can put you in touch with other guides in the region. 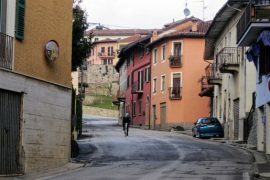 If you are interested in just a Piedmont driver service, a Langhe bike rental to explore the area, or car rental, click here for a list of providers. 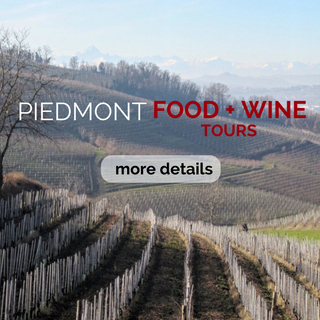 If you have more specific questions on planning a Piedmont wine tour, please leave us a note below or contact us directly. I love your site and all the great info! I am visiting the Piedmont area from September 24-October 2 then going down to Bologna to stay with a friend. I am super excited about driving around the Piedmont region and learning about the area, the culture and the wine! I am thinking that hiring out for a wine tour would be a great way to gain a base of knowledge about the wine and area in general. I will be staying just outside Asti the first few nights and then just outside of Alba for four nights. Ciao, Chris! Thanks for the note! So glad you’ve found the site helpful. I do hope we can meet while you are here! Hi! My family will be in Piedmonte, staying in Castiglione Falleto in late June. Can we plan a Barolo/Barbaresco wine tour on June 24th? I look forward to hearing from you. Thank you! We are living in Lake Como for the next few months and would like to set up a wine tour, maybe two days, with two place each day. We have a car but would like to have a guide that speaks english. Ciao, Robert! Thanks for the inquiry. I’ve sent you a message about our tour program. 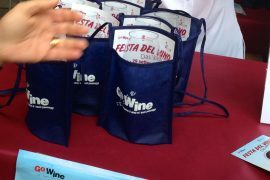 You can also find more details on our tour page, http://girlsgottadrink.com/piedmont-food-and-wine-tours/.